Weight distribution. As you trek on whichever terrain, downhill or uphill, some the weight your arms would have borne gets transmitted to these units. Ease of downhill descent. Going downhill has never been more fun, with much ease on joints thanks to trekking poles. Stability. Stability and balance are essential for a successful hike and these poles are a good way of enhancing stability while on the go because they will act as an additional pair of legs. There are different types of trekking poles in the market today and having the right unit for your activity makes your ventures much more fun and less cumbersome. Telescoping poles usually have three or four sections allowing them to adjust to different height needs. These poles, unlike their telescoping counterparts, are a single piece with a fixed height and no adjustability option. They are at times considered stronger as joints tend to weaken the poles. Folding poles will compact easily to a smaller size for ease of storage. Such poles are typically shorter, 6-9-inches long and lighter too. Hand grip material. Hand grips are either made of rubber, foam, or plastic. Rubber is preferred because it is soft on the palms, has good shock absorption properties, and will offer good grip even with wet or sweaty hands. Foam, on the other hand, is absorbent and soft on the hands. Plastic is durable and tough but lacks absorption and anti-shock properties. Trekking pole material. The most common materials trekking poles are made of are carbon fiber and aluminum. Carbon fiber is lighter and tough while aluminum is tougher and sturdier but a bit heavier. The frequency of use and the terrain they will be used on. Outdoor ventures are characterized by different types of terrain. Some are rugged, steep, rumbled with stones and pebbles, winding, flat and even, while still others are full of obstacles. For a regular hiker, an aluminum 3- or –section pole with rubber handle will make a good option. The not-so-regular hiker can go for the lighter carbon-fiber poles which are not as tough as aluminum. The rumbled or rugged hike requires a shock absorbing set of poles while the single, non-telescoping poles will suffice for a less frequent hike on even terrains. Weight. Lighter poles have always been preferred over heavier ones however if you have to choose between lightweight and durability, the latter is the better option albeit heavy.Number of sections on the pole – generally 3-section poles come with great height adjustment mechanisms and are easier to compact for storage or carrying in your rucksack. 4-section poles compact to a much smaller size than their 3-section counterparts. The number of sections on the pole. Generally, 3-section poles come with great height adjustment mechanisms and are easier to compact for storage or carrying in your rucksack. 4-section poles compact to a much smaller size than their 3-section counterparts. Adjustment mechanism. This is a vital consideration because different poles come with different adjustment locking mechanism and each has its pros and cons. While the twist-lock mechanism will yield strength and durability and is the most common mechanism in trekking poles, others have found that it takes a bit of effort locking and unlocking it plus with your gloves on, it’s hard to get a firm grip. Clamp lock also known as lever or quick lock is less common however they are easier to operate and a bit pricier. They are also a bulky addition to your pole. Shock absorption properties. This is an important feature, particularly during impact. Poles designed with shock absorption features absorb the impact that would otherwise be translated to your joints. However, these poles are typically a little heavier. Below is a detailed analysis of the top ten trekking poles in the market. We hope that this review along with our buying guide will help you select the right choice for your needs. No hiking experience would be complete without these pair of hiking poles. This pair of poles is lightweight, and you can easily collapse or extend its height to suit you. When the going gets tough and you’re all sweaty, the ripped hand grips ensure a firm grip and less slippage. A wide, padded wrist wrap also offers more support and comfort. Anti-shock springs cushions you against the shock making your hiking experience more exciting and less exhausting. It comes with carbide tips which make it suitable for a wide range of hiking experiences; whether it’s mud, snow or soft ground. Additionally, it comes with some great extras like a snow disc, liquid-filled mini compass, thermometer, and a LED flashlight and for the beginner, this is a good option. This is among the best trekking poles for hiking. It’s made of 100% Carbon Fiber, which means it’s not only extremely light but will also give you some good years of service. One of the best ergonomically designed lightweight trekking poles. Highly adjustable at a remarkable range of between 24 (61 cm) and 54 in (137 cm) making it quite versatile. Carbon is a great lightweight yet brittle and may not be the best for the more engaging ventures. The Quick Flip Lock feature enables you to extend or collapse your walking pole from 24 inches to 54 inches, or compact to fit into a carry bag, an extra included in its package. The ergonomically designed hand-grips are not only comfortable; the cork material they are made of is also a great moisture absorber. Carbon Fiber, being a natural anti shock material protects against shock while the non-slip EVA Foam Grip extension beneath the Cork Grip guarantees quick choke-ups on steep terrain. The fact that it is an ultra-weight makes it a perfect backpacking pole suitable for just any outdoor adventures. The Cascade Mountain Tech walking pole is made up of durable “aircraft grade” aluminum whose reliability you can count on especially when tackling challenging landscapes. Perhaps the most outstanding feature about this trekking pole is that it is built to stand tough use without giving in to the normal wear and tear. With aircraft grade aluminum construction, you can depend on it to stand through the most challenging rugged hikes and still remain intact. Speaking of comfort, CMT 1 trekking poles are designed with EVA foam grips help in absorbing moisture and providing a comfortable grip when braving tough hiking challenges. Anti-shock springs and cork grips cushion you against arm fatigue, which can often be exacerbated by hard landing and is typical of any professional hiking. These trekking sticks come with tungsten carbide and durable rubber tips known to offer excellent traction in any terrain. In addition, it comes with caps suitable for paved surfaces, baskets for snow, and rubber tips for asphаlt. This is top of the range trekking pole is also made of 100% Carbon Fiber material like the CMT poles. Being ultra-light makes it suitable for men, women, and children in addition to other amazing features that will certainly charm any serious hiker. The Quick Lock Technology feature makes quick height adjustments a breeze from a collapsed size of 24 in (61 cm) to the 55 in (140 cm) max extended height. This trekking stick goes a notch higher in comfort thanks to its anti slip natural cork grips, which other than absorbing sweat keeps the hands dry and cool during hikes. Some accessories included in its package are an added convenience to any user and will enable them to tackle any terrain; whether snow, mud or rocks. If you’re hiking in ice or in the Rocky Mountains, the Tungsten Carbide tips will come in handy whereas Thermostatic rubber tips are excellent in snow and mud conditions. With a 3-year warranty, Foxelli is one of the best trekking poles that will no doubt give you a run for your bucks. Carbon Fiber is a natural anti-shock material and an exceptional protection from the effect of impartial force typical of any hiking activity. It is quite durable too. The Ohuhu Trekking Pole is made of 7075 light aluminum making it one of the most popular and durable trekking poles for the avid mountaineer. Quite simply, this is the trekking pole to go for if you are looking for quality and adjustability. It offers a lot of flexibility for the user; with an extended height of 22 in (56 cm) and a collapsed height of 56 in (135 cm). Additionally, because an unnecessary load is the last thing you want during your hike, this unit is ultra light and sturdy with a combined weight of only 1 lb (454 g). The extra long EVA foam handles absorb moisture from sweaty hands to guarantee a firm grip. Unlike many other trekking poles, Ohuhu can be used comfortably in high altitudes and cold weather since it is weather resistant and can withstand temperatures ranging between (-80 °C (-112 °F) to 80 °C (176 °F). 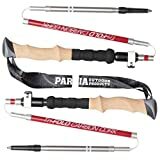 The Tri-Fold Carbon Cork walking poles combine Carbon Fiber shafts and aluminum connectors into a durable unit you’d consider having for just any hiking expedition. 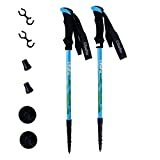 These trekking poles have a unique folding design that allows them to be collapsed down to less than 15 in (38 cm) or extended up to about 47 in (119 cm). Another great feature is its compact design, which enables the user to fold it down into a small backpack when not in use. The shaft material of these backpacking poles is 100% Carbon Fiber which is well known for its excellent shock repulsion properties. The handles on the other hand, incorporate the ergonomic Syncork technology which helps absorb sweat from your palms. Also appreciable, is their ultra-light weight, a feature which enables you to cover long distances without succumbing to arm fatigue. 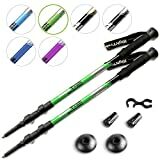 These are arguably one of the best hiking poles, perfect for hiking, walking, backpacking and snowshoeing. This is an extremely durable hiking stick made of the ultra-light aircraft grade aluminum alloy known to be sturdy and hard to deform making it ideal for the professional on a tough hiking venture or the enthusiast looking for a tough challenge. It is designed with EVA foam anti-skid handles intended for moisture absorption perfect for your palms along with special adjustable wrist straps that will protect your arms from fatigue. Collapse it down to 13.4 in (34 cm) and it will easily fit into a small backpack when not in use and when hiking extended to an internationally accepted standard length of 53 in (135 cm). For safety, the Tungsten Steel Rod Tips underneath the rubber footings offers a firm grip and better balance when hiking, not to mention it’s also abrasion resistant. For ease of height adjustments, this unit is designed with a Quick Lock System to give you an adjustable length ranging between 45 in (114 cm) and 53 in (135 cm). Like the Himal collapsible, the WildHorn trekking poles are made of strong and lightweight 7075 aluminum giving them a combined weight of 21 oz, these hiking sticks are undoubtedly light yet strong enough to take on the most challenging hikes. Light at only 1.3 lb (590 g) yet quite tough, the Taalo Trekking Poles are a must have for any serious hiker. 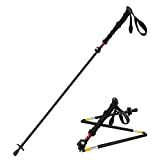 This trekking pole is adjustable between a collapsed height of 28 in (71 cm) and an extended height of 54 in (137 cm) to accommodate varying human heights. Comfort was not been overlooked either, their grips feature natural cork material known to absorb sweat to keep your hands cool, dry, and comfortable throughout the hike. As if that is not enough, they come with air ventilated extra padded straps for additional comfort along with an anti-shock technology feature that can be turned on at the click of a button. This is a strong, ultralight pair of walking sticks made of aerospace grade 7075 aluminum to give them a combined weight of 17 oz. The adjustable wrist-wraps, as well as the large ergonomically designed EVA foam handles, are a guarantee for all-day comfort. To accommodate both tall and short people the High Trek™ Trekking Poles flip lock height adjustment feature will enable you to easily adjust from collapse height of 25 in (63.5 cm) to 53 in (135 g). Furthermore, they come equipped with additional accessories such as tungsten-tipped ends, removable rubber ferrules along with mud and snow baskets to boost their functionality. This, in essence, means that rocks, snow, mud, or other obstacles in your path, should be smooth sailing. Simply switch gears to continue with your hike. These features bring to the table the kind of versatility that’s only unique to the High TrekTM Trekking poles to achieve an adventurous hike in any terrain without compromising stability or balance. These are uniquely designed ultra-light, durable walking sticks made from the alloy of 7075 aluminum. As opposed to other steels, T6 incorporates zinc and magnesium properties, which makes it light and durable. These poles ideal for hiking can be folded down to 13.5 in (34 cm) when not in use for easy portability. With the Quick Flip Lock Technology, you can adjust the height from 44 in (112cm) to 54 in (137 cm). It is therefore unsuitable for persons shorter than 5’3″. Since the poles are ultra-light, you can comfortably cover long distances without experiencing a lot of fatigue, which makes it ideal for expeditions. EVA foam handles provide an all-weather comfortable grip while absorbing moisture from your hands. 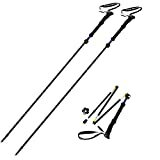 These hiking sticks are ideal for backpacking trips, snowshoeing adventures, and other adventures. Hiking is definitely an exciting adventure and the success of it all lies in choosing the right tool for the job. Trekking poles offer you better stability and balance when tackling a challenging terrain to significantly reduce the impact of a heavy load and protect your hips, knees, and ankles. Whatever terrain you’re planning on taking, make sure you take your pick from some of the best trekking poles reviewed which can offer practicality, reliability, and value for money. I was looking for info on the poles. Thanks for putting together this guide. Helped a lot.